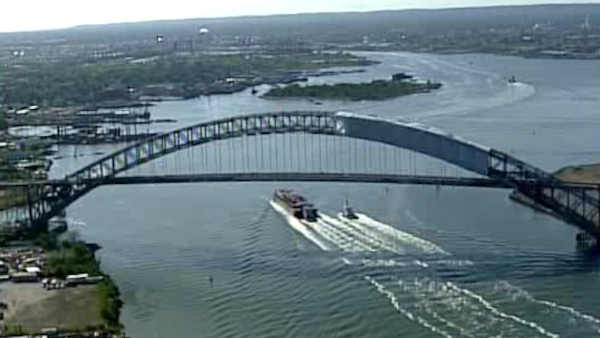 The Bayonne Bridge is set to open to drivers next week, authorities said. The bridge connecting Bayonne, New Jersey, to Staten Island, New York, will open Monday after years of work to raise the deck, The Port Authority of New York and New Jersey said. Construction on the $1.3 billion project to allow bigger cargo ships to reach New York City-area ports began in 2013. The roadway was raised to 215 feet above the Kill van Kull, 64 feet above the original deck. The previous height limited the size of vessels that could pass underneath on their way to the ports of Newark and Elizabeth. Ships' masts passed mere feet below the span. The bridge will use a cashless toll system, using a combination of EZ Pass and mailed tolls. A separate, project completed late last year deepened navigation channels in New York harbor, at a cost of $2.1 billion, in anticipation of the larger ships. The Port Authority initially hoped to accommodate larger ships in 2016, but officials revised that estimate in 2015, citing construction delays related to weather and structural problems with the bridge's steel. The larger ships are expected to be able to pass under later this year. The new roadway has wider lanes and a median it's the first Port Authority bridge to use cashless tolls.